Volcano Science Museum is a comprehensive learning facility of Mount Usu to introduce the mountain's volcanic history, the mechanism of eruption, the actual damages in the past, and disaster prevention measures in the local communities. 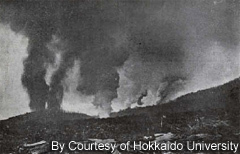 At this volcanic eruption started on July 21, 1910, Professor Fusakichi Omori of Tokyo Imperial University carried out observations of volcanic earthquakes using a seismometer for the first time in the world. He also conducted a deliberate survey to measure the land deformation. The chief of the police station, Seiichi Iida, had attended Professor Omori's lectures and predicted the eruption from the preceding earthquakes. He ordered the residents within 12 kilometers around Mount Usu to evacuate beforehand, and no casualties were caused. At the hour before dawn on August 6, 1977, a series of small earthquakes began at Mount Usu. The earthquakes became noticeable around 3:00 a.m., and at 11:30 a.m., the Muroran Regional Meteorological Observatory announced an eruption alarm. The earthquakes further gained intensity, and at 9:12 a.m. on August 7, suddenly a white eruption column stood high from the top of Mount Usu. The smoke rising silently into the sky captivated many tourists who happened to be there, and some of them took pictures with the mountain and the smoke in the background. 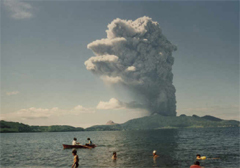 The eruptions in 2000 started at the western foot of Mount Nishiyama at 1:10 p.m. on March 31, 2000. Although the eruption started at the western foot of Mount Nishiyama, various observation data indicated possible eruptions at the mountaintop. Eruptions at the summit were prone to generate massive pyroclastic flows, which destroyed the mountain foot four times in the past. The observatory squad remained highly alarmed. At 2:30 p.m. on March 31, the government established the regional disaster emergency center in Date City, and possible evacuation plans were examined in the first meeting on the assumption of explosions at the top of Mount Usu. Three municipalities had already issued an evacuation order, and on March 31, they expanded the region subject to evacuation, and the whole city area of Abuta Town (present Toyako Town) was added to the designated evacuation area. The residents temporarily moved to 30 shelter homes set up across six municipalities. At the beginning of April, the number of residents evacuated reached 16,000, and some of them were forced to stay in the temporary housing for about five months. On April 1, another crater opened at Mount Konpira. The danger of volcanic eruption at the mountaintop also continued. At the western foot of Mount Nishiyama, rapid land upheaval materialized. At 9:35 p.m. on April 5, the Coordinating Committee for Prediction of Volcanic Eruptions (CCPVE) announced that it was likely that the volcanic activities would be shifting to dome growth stage at the western foot of Mount Nishiyama, and that there was a possibility of massive volcanic eruptions within two weeks. Volcanic explosions and ground deformation continued at the western foot of Mount Usu in April, and damage continued to expand. Hot mudflows discharged from the crater of Mount Konpira reached its vigorous peak between April 7 and April 10. On April 7, the hot mudflow overflowed its running course and poured into Lake Toya. On April 9 and April 10, two bridges on Route 230 were washed away by hot mud flows, and a municipal hot spring bath facility and a library were also destroyed. By the crustal disturbances continued at the western foot of Mount Nishiyama for about five months, the land was uplifted by approximately 80 meters. Devastation of Route 230 and the buildings progressed due to the ground deformation. The volcanic activities at the western foot slowed down gradually from April to May. On May 22, CCPVE commented that multiple observation data suggests declines in the volcanic activities, and on July 10, the committee announced that cessation of activities was underway, which led to the lifting of the evacuation order for the residents of Lake Toya hot spring region. Thereon at the start of August, land upheavals at the western foot stagnated, and in September, upheavals subsided and reversed. At the eruption in 1977, a certain phenomenon was the decisive factor to conclude that the volcanic activity is coming to an end. And that is, the pace of the volcanic land upheaval becoming dramatically sluggish and the land slightly sinking reversely. A similar phenomenon was observed at the eruption in 2000, and the activities came to cessation. However, small geothermal activities still continue to the present day. Copyright 2007-2008 Volcano Science Museum. All Rights Reserved.